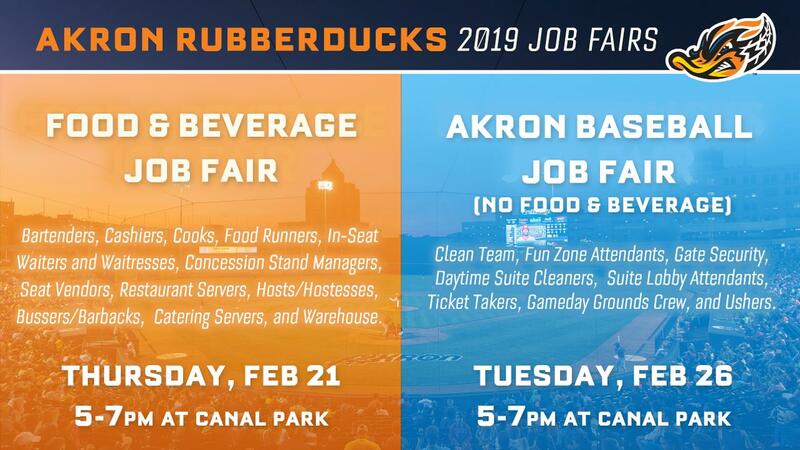 (AKRON, OHIO) Jan. 29, 2019 - The Akron RubberDucks announced today it will be holding two job fairs for the upcoming 2019 season-- the Food & Beverage Job Fair on Thurs., Feb. 21, and the annual Akron Baseball Job Fair on Tues., Feb. 26, for game-day and part-time positions. Both job fairs are at Canal Park and run from 5 p.m. to 7 p.m. The Food & Beverage Job Fair on Feb. 21 covers positions working the concessions stands, suites, and The Game Grill + Bar. Positions available include: Concessions - Bartenders, Cashiers, Cooks, In-Seat Servers, In-Seat Vendors, Runners, Stand Managers, and Warehouse; Suites - Bartenders and Cooks; The Game Grill + Bar: Bartenders, Bussers/Barbacks, Cooks, Hosts/Hostesses, and Servers. Applicants are asked to bring a resume and prior experience is preferred. "With the popularity of our concessions and the expected large summer crowds, we are looking for hard-working, enthusiastic candidates who will help support our goal of providing an unmatched customer experience at Canal Park," said RubberDucks Director of Food & Beverage Brian Manning. For the Akron Baseball Job Fair on Feb. 26, available positions for the 2019 season (70 home games) include: Clean Team, Daytime Suite Cleaners, Fun Zone Attendants, Gameday Grounds Crew, Gate Security, Suite Lobby Attendants, Ticket Takers, and Ushers. "We are excited about the upcoming season and are looking for the best of the best to provide outstanding customer service during all our home games in 2019," said RubberDucks General Manager Jim Pfander. "Canal Park is a great place to work for those students who are home from college to those looking for a fun, part-time job working outside during the summer months." Candidates should enter Canal Park through the administrative office entrance at 300 South Main Street, Akron, Ohio 44308. To expedite the process, the RubberDucks have applications for both job fairs on its team website www.akronrubberducks.com. Applicants can print, if possible, and complete the application before coming to the job fairs. Non-profit groups interested in working at Canal Park should email Brian Manning at bmanning@akronrubberducks.com for information about potential fundraising opportunities throughout the year. What: Job Fair for all food and beverage-related positions at Canal Park and The Game Grill + Bar. When/Where: Thurs., Feb. 21 starting promptly at 5:00 p.m. until 7:00 p.m. Candidates should enter The Game Grill + Bar, which is located near the corner of S. Main St. and State St.
Positions Available: Concessions - Bartenders, Cashiers, Cooks, In-Seat Servers, In-Seat Vendors, Runners, Stand Managers, and Warehouse; Suites - Bartenders and Cooks; The Game Grill + Bar: Bartenders, Bussers/Barbacks, Cooks, Hosts/Hostesses, and Servers. Applicants are asked to bring a resume and prior experience is preferred. No interviewing for the Akron Baseball Job Fair positions will take place during the Feb. 21 Food & Beverage Job Fair. What: Job Fair for seasonal game-day and part-time positions for the 2019 season. When/Where: Tues., Feb. 26 starting promptly at 5:00 p.m. until 7:00 p.m. Candidates should enter through the Canal Park Main Administrative Office entrance located at 300 South Main Street. Positions Available: Clean Team, Daytime Suite Cleaners, Fun Zone Attendants, Gameday Grounds Crew, Gate Security, Suite Lobby Attendants, Ticket Takers, and Ushers. For more information about either Job Fair, candidates can call 330-253-5151 or go to www.akronrubberducks.com.